Please excuse me if you are getting this twice. 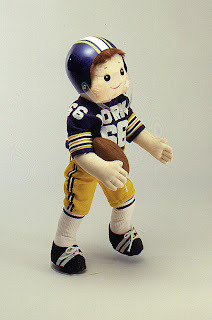 I just posted it on my new FB Page Carolee Creations SewSweet Dolls - patterns for cloth doll making. I think this is useful information that solves a problem many of you have had in trying to make the helmet for Crusher. I would appreciate it if you would go to my new page and 'like' me. (I feel like Sally Fields.) Thanks! http://www.caroleecreations.comIf you know anyone who is having this problem, please refer them to my facebook page. Amy is one of the most endearing, enduring favorites from the SewSweet Dolls pattern collection. She is designed to resemble my daughter Amy at age 3, and "yes", her hair really was that long. I just finished a phone conversation with an old customer who was reminiscing about the Amy dolls she made 20 or more years ago. She is now making them for her great-granddaughters. 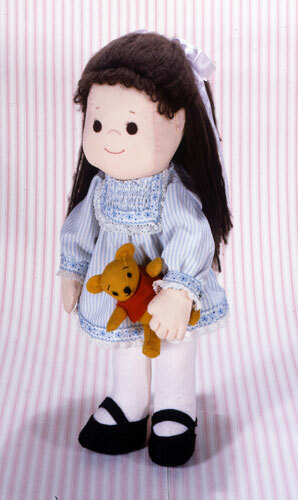 Amy 16" & Willie Bear 4"
Little girls always like long hair. (Actually, that's not exclusive to little girls - lots of people like long hair.) Amy loved it, as a little girl, and has her whole life. She was really upset with me when she got her first hair cut, before kindergarten. She looked adorable, but - her hair was never short again until she was a career woman, and decided it might be easier. Amy has additional clothes patterns that give her a nice variety of styles to pieces to mix and match. She's a fun gift for little girls, and fun to sew. The person I mentioned earlier said that she had made dolls for all her daughters and granddaughters. Her son wasn't so sure his son should have a doll but has changed his mind. It seems that they are 'expecting' a baby boy, and big brother has already named him - so she is making a baby boy doll for him.